Channel Paris via this South End French restaurant’s smart plats du jour. 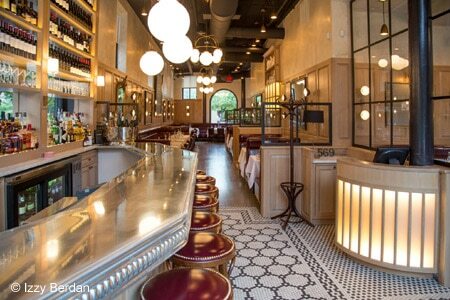 : This South End restaurant offers traditional French bistro classics with a twist. For example, on Thursday you may encounter roasted lamb with apricot carrot purée while Tuesday presents pan-roasted trout with almond purée, figs and lemon vinaigrette. Steak frites is a must with its black truffle vinaigrette and watercress shallot salad. The kitchen continues to hit its mark with dishes like arctic char with haricots verts, olives, fennel and fingerling potatoes as well as the pork tenderloin with saffron orange braised endive. To complement these well thought out dishes, the French-Californian wine list offers expansive by-the-glass options and some high-end bargains. For dessert, we suggest the bittersweet chocolate mousse. With its dimly lit row of banquettes, this might just be as close to Paris as you can get in Beantown.